Carrie Turman Culpepper, 12 Nov 1863 – 2 Apr 1944. John F. Culpepper, 6 mos., M, born Clarke Co., AL. Cornelia Kelly, 27, F, Wh, Housekeeper, AL. H. B. Culpepper, M, 21, Boarder, S, AL n/a n/a, Farmer. McLennan Co., TX: Harris B. Culpepper and Miss Carrie Turman, 8 Aug 1883, W. G. Boyd, J.P.
William Ernest Culpepper, 4 May 1884 – 10 Sep 1904. Aubrey John Culpepper, 20 Jul 1893 – 14 Apr 1949. Infant Son Culpepper, 20 Jul 1893, aged one day. + Nancy Culpepper, 12 Sep 1832 - 26 May 1898. Mrs. C. Turman, Mother-in-Law, F, May-1839, 61, Wid, Ch 7/5, GA GA GA.
+ B. W. Culpepper, 22 Nov 1820 - 18 Feb 1907 (Erected by his daughter, Amanda Elizabeth). Aubrey Culpepper, Son, M, 16, S, TX AL GA.
John Culpepper, Son, M, 25, S, TX AL GA.
Harris B. Culpepper, McLennan Co., Dec 26 1926, 42875. Culpepper, Mother, F, Wid, Wh, 70, Old Age, NC/NC/NC. John T. Culpepper, Brother, Wh, M, Jan 1870, 30, sng, AL/NC/NC. E-mail written 6 Nov 2011 to Warren L. Culpepper from Arthur Green, e-mail address. G. L. Culpepper (Mr.) married S. C. Green on 4 Apr 1867 in Monroe Co., Alabama. Erastus Alonzo Culpepper, Picayune, Pearl River Co., MS, Age 33, Born 3 Nov 1885, White, Engineer for NO&NE RR at Picayune, Pearl River Co., MS. Nearest relative: Mrs. Ethel Culpepper, Picayune, Pearl River Co., MS, /s/ Erastus Alonzo Culpepper, Tall height, Medium build, Brown eyes, Black hair, No disabilities. Registered 12 Sep 1918 in Pearl River Co., MS.
1840 Census 1 Jun 1840� Gideon and Joseph was probably a free white male, age 5 and under 10,in Alexander Culpepper's household, on the 1840 Census on 1 Jun 1840 at Oktibbeha Co., Mississippi. Alexander Culpepper, 1 M0-5, 1 M15-20, 1 M30-40, 1 F0-5, 1 F30-40, 8 Slaves. Alexander Culpepper, 2 M5-10, 1 M10-15, 1 M40-50, 1 F0-5, 1 F15-20, 1 F40-50, 15 slaves. Casandra Culpepper, 12, F, MS.
Martha Waddle, 14, F, MS.
Gideon Alston Culpepper, Pension# S8733, Unit: 48th Inf. Elbert Maddox, 18, M, Wh, Farm Laborer, MS.
G. A. Culpepper and Mrs. Martha A. Eggleston married 2 Jan 1878 in Lowndes Co., MS.
William Lewis Culpepper, 1960 Sherman Drive, Denver, Denver Co., CO, age 34, born 6 May 1884, White, Railroad trainman for Union Pacific RR at Union Station, Denver, CO, Nearest relative: Susan B. Culpepper (Wife) at 1960 Sherman Drive, Denver, Denver Co., CO, tall height, medium build, brown eyes, brown hair, no disabilities. Registered 10 Sep 1918 at Denver, CO.
+ Gideon A. Culpepper, VCV, 1 Jan 1830 - 4 May 1908. J. J. Culpepper and Cora Page married 19 May 1891 in Oktibbeha Co., MS.
1840 Census 1 Jun 1840� Cassandra was probably a free white female, age 5 and under 10, in Alexander Culpepper's household, on the 1840 Census on 1 Jun 1840 at Oktibbeha Co., Mississippi. Cassandra Culpepper and Robert C. Winfield married 2 Jan 1862 in Oktibbeha Co., MS.
Police District 1, Lowndes, Mississippi; Roll: M593_738; Page: 166; Image: 73. + Fannie W. Huff Culpepper, 3 Jan 1837 - 6 Dec 1910. Elisha Culpepper, 1 M0-5, 1 M20-30, 1 F20-30. John Culpepper, 1, M, GA.
Elisha P. Culpepper, 2, M, GA.
Thomas J. Culpepper and Fannie V. Huff on 15 Oct 1865, Talbot Co., GA, Book C-631. Ludy Culpepper, 2, M, GA.
Louda Culpepper, Son, M, S, 11, At Home, GA/GA/GA. Photographed say 1885� He was photographed say 1885 at Talbot Co., Georgia. Photographed* say 1904� He was photographed say 1904 at Talbot Co., Georgia. Biography* � O'Neals: Mr. W. H. Culpepper, 83, passed away Tuesday night. He was a Confederate veteran, belonging to the 3rd Georgia Calvary, Company C. Of 107 men in his company, he was one of five still living. Georgia Division United Daughters of the Confederacy, Roster of Confederate Graves, GA: UDC-GA, 1995. William H. Culpepper, Co. C, 3rd GA Cav., no dates. William Culpepper and Ellen N. Biggs on 22 Dec 1868 in Talbot Co., GA.
+ W. B. Culpepper, 17 Feb 1870 - 13 Oct 1935. William Culpepper, 5/12, M, GA.
+ Arthur Culpepper, 27 Jul 1877 - 22 Aug 1878. William H. Culpepper, served in Company C, 3rd GA Cavalry, see Ellen N. Culpepper, widow, of Talbot County, GA.
Talbotton New Era, July 1925. 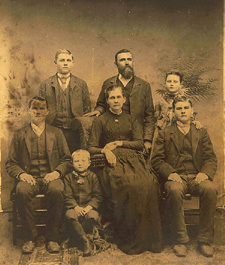 Photographed say 1885� She appeared as a wife in a family photograph say 1885 at Talbot Co., Georgia. Bartow Culpepper, Son, M, S, 17, Laborer, GA/GA/GA. Sarah Culpepper, Sister, F, Mar 1854, 46, S, GA/GA/GA, Landlord. Barton Culpepper, Brother, M, 59, Sng, GA/GA/GA, Farmer. Biography* � Saturday morning at about 6 o'clock, the spirit of Mr. J. W. Culpepper, better known as "Uncle John," took its heavenly flight. He lacked just a few days being 79 years old. Source: News From the New Era by Nelson Goolsby, March 1928. John W. Culpepper (White), d. 4 Mar 1928 in Talbot Co., GA, # 8410-J. Julia R. Culpepper, Wife, F, 69, M, md @ 20, GA/GA/GA. Sarah Culpepper, Sister, F, 75, S, GA/GA/GA. Elisha P. Culpepper, d. 9 Aug 1937 in Talbot Co., GA, # 21605. Francis B. Culpepper, d. 9 Jan 1940 at 79 years in Talbot Co., GA.
Sampson Culpepper, 1 M0-5, 1 M30-40, 1 F0-5, 1 F20-30. Nathaniel M. Dozier, 20, M, School Teacher. Alexander Culpepper, 8, M, GA.
Lillian Henderson (transcription by Fred Gleaton), compiler, Roster of Confederate Soldiers of Georgia, 1861-1865, Americus, GA: Lake Blackshear Regional Libray, 1964. Sampson Culpepper, 73, M, White, Md, NC/NC/NC, Farmer, died May 1880 from Paralysis. Eddy Culpepper, Son, M, S, W, 6, GA/GA/GA, --. Richmond County Court of the Ordinary, Richmond Co., GA Marriages, 1806-1901, Books A-X, Salt Lake City, UT: Genealogical Society of Utah, Repository: LDS Family History Library - Salt Lake City, Call # Films # 158,602 - 158,611. S. H. Culpepper and Lottie E. Skinner on 6 Nov 1883 in Richmond Co., GA, Book M-234. Christian Index, May 14, 1896, Page 6, Column 4. Copy found on film and transcribed by Judy Jolly on 15 Jun 1999 at the Georgia Department of Archives and History in Atlanta. Sarah J. Howell, Sister, F, 69, Wid, GA/GA/GA. Louisa L. Culpepper, 17, F, Student at Monroe Female College, GA.
Bill Culpeper, Son, M, Sep 1881 (18), S, GA/GA/GA, Carpenter. James F. Culpepper, Son, M, S, W, 1, GA/GA/GA. Willie A. Culpeper, M, 9, GA.
Lizzy Culpeper, Dau, F, 30, Sng, Warren Co. GA/Warren Co. GA/Warren Co. GA, Telephone Operator. Estimated date of reloaction is based on the facts that Gardner and Caroline were founding members of Long Creek Baptist Church in Warren Co in July 1839 but then appeared in the census in Lee County in Jun 1840. Gardner Culpepper, 1 M15-20, 1 M20-30, 2 F0-5, 1 F20-30. Mary A. M. Culpepper, 2, F, GA.
1853 relocation is based on the fact that in that year, Gardner and Caroline had only moved to Lee County in 1848, were still there at the time of the 1850 census, and then in 1853 they became founding members of a church in Thomas Co.
Nancy F. Culpepper and Kinchen L. Taylor on 23 Nov 1856 in Thomas Co., GA.
+ Caroline Culpepper, 23 Apr 1815 – 18 Nov 1885. In addition to fertile lands around Palmyra, the hammock lands northward along Kinchafooa and Muckalee Creeks were found to be rich. With increasing settlement and cultivation the pine high lands, on both sides of the territory drained by the Kinchafoona, Muckaloochee, and Muckalee Creeks, were found to be also almost equal to the hummocks in fertility. The soil of the county came to be considered as mostly fertile. Only the western part, having a reddish, thirsty, sandy soil, and a belt along the Flint River in the eastern part were found to be of inferior quality. "We were shown on Monday last, two stalks of cotton from the plantation of Mr. Robert Thompson, of Lee County. One stalk was of the Grand Gulf Cotton... about six feet high, and had some eight or ten full grown bolls on it. We were assured that there were several bolls opened in the field from which this was taken. The other stalk was nearly six feet high, and had on it upwards of one hundred bolls and forms. It was not quite so forward on the other stalk. There is said to be two hundred acres of cotton on the same plantation as good as these specimens..."
With such inducements large numbers of settlers came in from Liberty, Burk, Baldwin, and Putnam Counties. Rich plantations of hammock land grew up along the Kinchafoona and Muckalee Creeks. By 1849, the distribution of cultivated farming lands was shown by agricultural settlements to the north of Palmyra: Cotton Bluff (probably so named as a collection point for shipping cotton to Albany), Starkville with new settlers, Oceola and Chenuba, to the northwest, and Sumterville, to the northeast. Despite the transfer of a strip of this county's lands to Dooly County in 1842, population increased from 2,370 white and 2,706 black in 1840 to 3,025 white and 3,634 black, including 7 free black, in 1850. The white population was the largest the county has ever had. There were 387 farms, averaging seven whites with nine slaves to the farm, and 550 dwellings. Since the county contained 506 square miles or 323,841 acres, the landholdings in and adjacent to each farm average 837 acres. The major portion of the land was the unpeopled pine and swampy land surrounding the plantations. Real estate in the county had a tax valuation of $l,148,224, and an average sale value of $10 per acre. Personal estates, largely slaves, were valued at $2,207,702. Since there were 3,626 slaves, the average value per slave was about $600. The ordinary crop of a county planter was 100 to 2,000 bales of cotton. Average yield of the land per acre was 800 pounds of cotton, 20 bushels of corn, and 10 bushels of wheat. Little attention was paid to orchards. The history of farming in Lee County was probably similar to that generally of the cotton belt in southwestern Georgia. There was an influx of small farmers interested in growing cotton. Some chanced upon rich lands, others upon poor; some were near navigation, others were far; some were expert, vigorous, frugal and farsighted, others were slack, spendthrift or merely perhaps unlucky. Profits from efficiency and good fortune enabled some to buy slaves and then to buy neighboring lands and attain eventually the scale and rank of planters. For their added lands they, raid prices acceptable to those who heard the loud call of the West; but they could force no man to sell who was not so minded. There were several farmers to every planter, throughout the best cotton zone, each producing cotton in sturdy competition with his neighbor, great or small. "Divergencies were of continuous gradation from the wealthy to paupers." In the last instance only does Lee County differ. There is little record of poverty among the white people in Lee County before the War. Gardner appeared in the 1840 census inTalbot County and in the 1850 census in Lee County. He is presumed to have relocated coincident with the Lee County boom. Amanda Culpepper and Mitchell B. Parramore on 21 Jul 1858 in Thomas Co., GA. Biography* � There were John G. Culpeppers who served in the following three units from Georgia: Company A, 3rd GA Cavalry, Company G, 26th GA Infantry, and Company E, 29th GA Infantry. His brother William H. served in Company B, 29th GA Infantry, so the 29th GA Infantry is the most likely possibility for John Gardner Culpepper's unit. John was killed in the Battle of Atlanta. J. S. Culpepper, 4, M, GA.
S. Brinkley, 12, M, GA.
7 Aug 1923 pension application by William Henry Culpepper, age 78, born 14 Feb 1845 in Warren Co., GA, stating that he resided in Florida since 1910. W. H. Culpepper and Jane E. Turner on 19 Apr 1866 in Thomas Co., GA, Book H-268. Jane E. Culpepper, Wife, F, 64, Md 44, ch 5/5, GA/GA/GA. "Harry Stuart Culpepper, Rt #1, Arcadia, FL, born 17 Nov 1892 in Boston, GA. Occupation is farmer. Has a wife and child. Claimed exemption from the draft based upon being a farmer and ______. Height is tall, eyes light brown and hair dark. No disabilities. Date of registration illegible. DeSoto Co., FL." Jane E. Culpepper, Wife, F, W, 74, M, GA/GA/GA.